People keep on predicting various planets out of the same datasets and they never seem to amount to much, so I'm not going to get particularly excited for this one. What's the chances of this being a image of this planet?? Pretty low. Consensus is that the object seen in that image may be a speckle. Indeed the paper was retracted. Also, it's not really in the same direction as the predicted orbit. And I have to agree with Lazarus here. Don't get your hopes up. Hey, at that Forbes webpage they have used an exoplanet artwork of mine! Anyway it's long time since something at Solar System's outskirts has been inferred. Let's cross fingers. Effectively zero. Alpha Centauri is in a completely different area of the sky than the predicted orbit of "Planet Nine" in this paper. Having a predicted orbit is a good point: the theory is testable and not just a "i guess there is a planet, i will anounce in the hope to illuminate my post-doc". And also Mike Brown is like the Michel Mayor of TNOs, not just a bored student. Yeah, he's the Pluto Killer. With such an elongated orbit, it was likely ejected from amongst the Big Planets while they were forming and migrating. Thus it had plenty of opportunity to grab an atmosphere of H2/He. If it wasn't too thick a veil, there's a chance that Planet 9 could have a surface warm enough for liquid water. David Stevenson speculated on that possibility years ago. Could it be the planet inferred by Rogozin in 2012 and nicknamed "Deposs"? Brown & Batygin "Observational constraints on the orbit and location of Planet Nine in the outer solar system"
de la Fuente Marcos & de la Fuente Marcos "Finding Planet Nine: a Monte Carlo approach"
Mustill, Raymond & Davies "Is there an exoplanet in the Solar System?" The argument for a perturbing body seems to have gotten stronger, with another object (UO3L91) contributing to the ω-clustering. Do you have a source for that image? Interesting to see something more eccentric and at a larger semi-major axis than Sedna. Yeah! I'm sorry I should have included that! It's from Mike Brown's twitter. Let's start invoking more distant planets to explain more stuff! Holman & Payne "Observational Constraints on Planet Nine: Astrometry of Pluto and Other Trans-Neptunian Objects"
Possible problems for the Planet Nine hypothesis? Shankman et al. 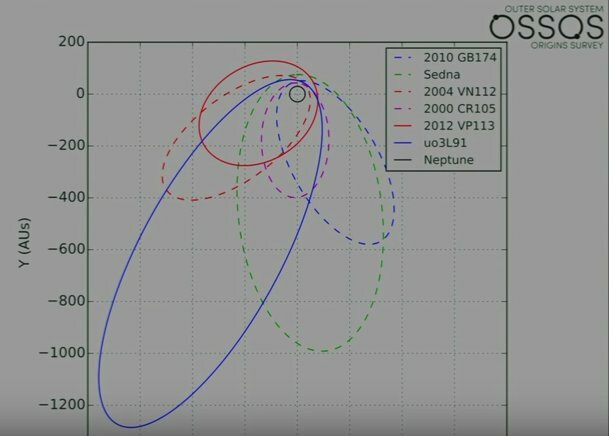 "Consequences of a Distant Massive Planet on the Large Semi-major Axis Trans-Neptunian Objects"
Millholland & Laughlin "Constraints on Planet Nine's Orbit and Sky Position within a Framework of Mean Motion Resonances"
A great summary of the current work regarding this "Planet Nine" on the Systemic blog. Lazarus wrote: Possible problems for the Planet Nine hypothesis?